Police say a man killed his girlfriend, and set a Bucks County motel on fire, using gasoline and the victim's own cigarette. BENSALEM, Pa. (WPVI) -- Police say a man killed his girlfriend, and set a Bucks County motel on fire, using gasoline and the victim's own cigarette. Kevin Smalls, 46, of the 2600 block of Southampton Road in Philadelphia, is in police custody. He is being charged with criminal homicide, arson and numerous other offenses. He was denied bail during his arraignment on Sunday afternoon in the death of 46-year-old Melissa Bacon-Smith, also of Philadelphia. When asked by reporters what he did, Smalls said "I lost it." When asked again, he said "Bad things. I hurt someone I love." 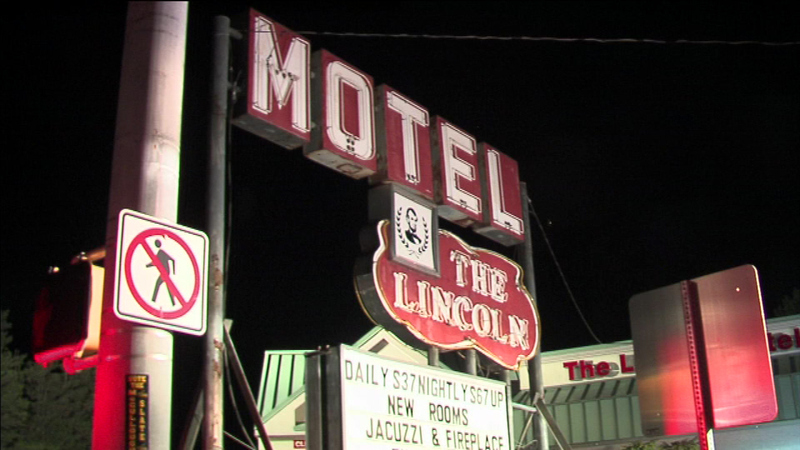 Investigators say the fire at The Lincoln Motel in the 2200 block of Lincoln Highway around 2:30 a.m. was the result of a domestic dispute. One person was killed in a fatal fire in a motel in Bensalem, Bucks County. "I don't know what sparked it. He claimed she laughed at him earlier in the night, but that's his side of the story," said Lt. Robert Bugsch of the Bensalem Police Dept. Authorities say Smalls bought a cup of gasoline from the Wawa across the street, came back to the motel, flung it on Bacon-Smith while she was smoking, and left. "We believe she reached out to him and yelled his name, and he left her in there to die," Bugsch said. Smalls left the scene but was found not far away with burns to his hand. As he left for jail, he told reporters that's where he belongs. When asked if he had anything to say to his girlfriend's family, he said "I'm sorry." Bacon-Smith was a mother of four and a grandmother of seven. Her daughter tells Action News she will be deeply missed. Firefighters arrived to find heavy black smoke coming from rooms 103 and 104, but firefighters had the blaze under control by 3 a.m.
Crews rescued at least three people from rooms on the second floor. Several people were taken to Aria Health Torresdale for smoke inhalation. Police say their injures do not appear to be life threatening. Action News spoke with witnesses who say the smoke was very intense in the hallway as they were trying to make their way out. The Southeastern Pennsylvania Red Cross is assisting people who were staying at The Lincoln.